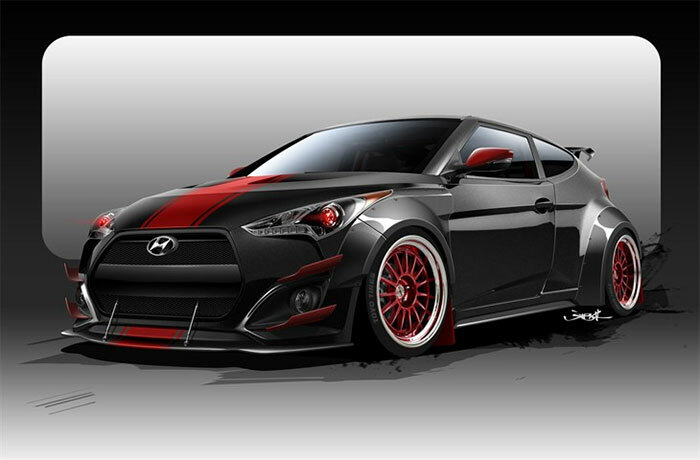 Hyundai and Blood Type Racing are teaming up on another SEMA show car that may be one of the coolest Velosters we have seen. Not much about the car is left stock, it wears a carbon black paint color with cool red racing stripes. A custom carbon fiber body kit gives the car a very wide look and should allow more rubber under the fenders. On the rear of the car is a spoiler and the car has custom wheels and red projector headlights. Power comes from a 1.6L four cylinder that comes in the Veloster. It received BTR cylinder sleeves, high-boost turbo from Garrett with custom connecting rods and pistons. The result of all that engine work is a car with more than 500hp under the hood. BTR claims that the car has factory drivability. The interior is stripped out to make it more racecar-like including a roll age, racing seats, harnesses, and a racing steering wheel. The car does get an updated audio system, something that isn’t needed for racing or track work. The official unveil for the car will be November 3 in Las Vegas during the Hyundai press conference.